This year, don’t let Halloween sneak up and scare you! We’re here to give you tricks and treats. Read on for Halloween recipes and a sneak peek of Halloween decorations that will only be in store for a limited amount of time. These ALDI Finds products are constantly refreshed in store based on trends and seasonal relevancy. Think of them as delightful surprises every time you shop! As we approach Halloween, use these items to spook up your home. Light candles for a cozy fall. Our Huntington Home 3-Wick Candles ($3.99) will fill your house with the scents of fall. 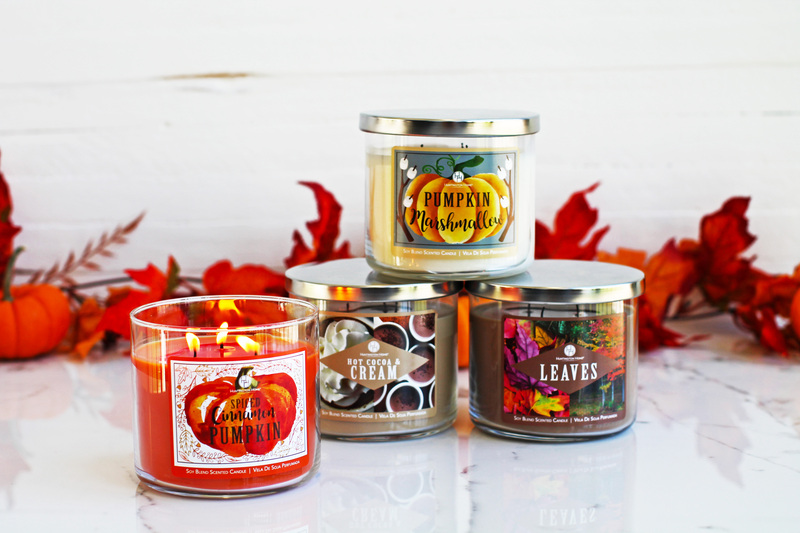 If you’ve had enough Halloween candy but are still in the mood for something sweet, light a Hot Cocoa & Cream, Spiced Cinnamon Pumpkin or Pumpkin Marshmallow candle. Halloween Flameless Lanterns ($6.99) are available in Clear Ghost, Purple Happy Halloween and Orange Haunted House designs. They include a hook for hanging and since they are flameless, they can burn through the midnight hour to greet all of your trick-or-treaters. Give your house an eerie glow with 20-Count LED Battery Operated Halloween Lights ($2.99). They are available in a variety of colors and shapes, including pumpkins and eyeballs. 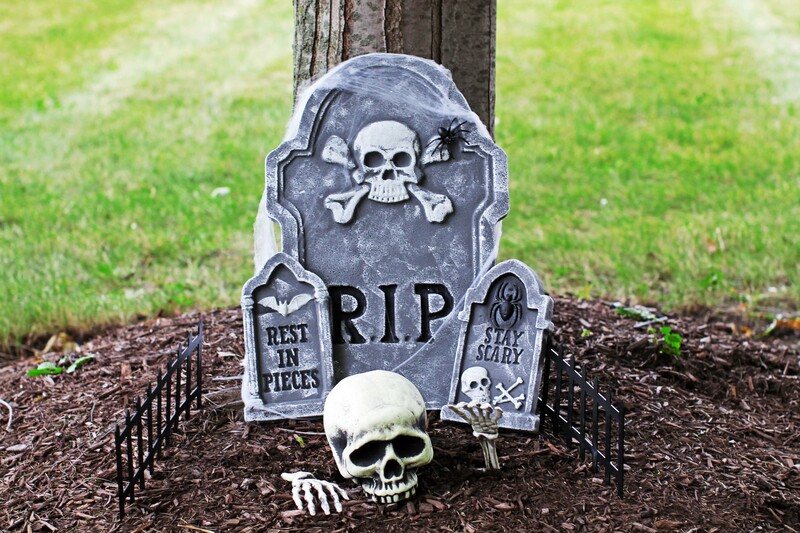 Hurry to your local store on 10/10 to purchase this tombstone set before it’s too late. Turn your yard into a creepy graveyard with the Huntington Home Reaper Figure ($9.99) and the Huntington Home 14-Piece Tombstone Set ($12.99). The reapers have eyes that light up! The tombstone set has fourteen pieces that lets you put your creativity to use. What scene will you create? We think the best decorations are the ones that take the least amount of effort to set up. Our Huntington Home Mini Halloween Projector ($39.99) has easy instructions and seven Halloween videos/projections that will delight any ghost or goblin who stops by. 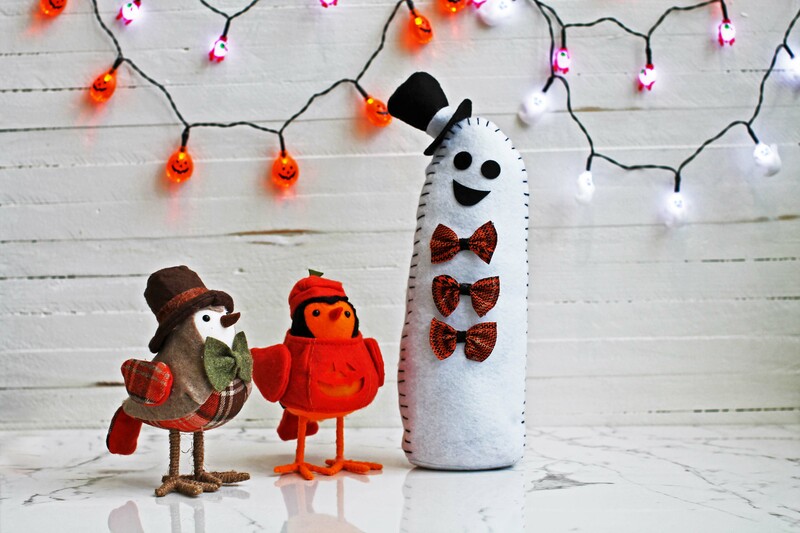 You won’t mind if adorable Halloween and Harvest Fabric Tabletop Figures ($4.99) haunt your table. Make friends with these Halloween and Harvest figures. Did you know that Halloween also happens to be National Caramel Apple Day? 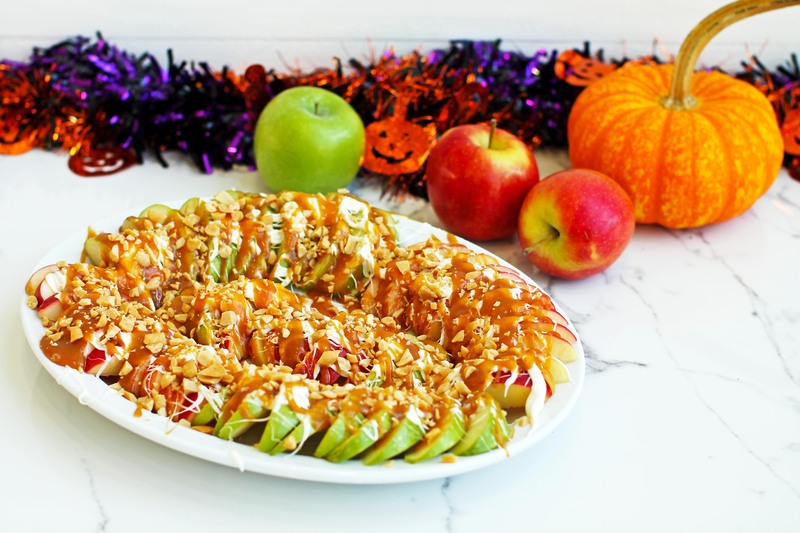 These simple Caramel Apple Nachos will give your taste buds chills. -2 Honey Crisp Apples and 2 Granny Smith Apples NOTE: You may need more if you are using a larger platter. *Item is seasonal and in-store for a limited time. Core and slice the apples. Arrange them on a plate or platter. If you want to prevent the apples from browning, squeeze some fresh lemon juice on the slices. Take the white chocolate morsels and put them in the microwave for 30 second intervals until the chocolate is melted. Similarly, take a few spoonfuls of the caramel dip and warm it in the microwave until it’s soft enough for drizzling. Drizzle the white chocolate on top of the apples. Follow with the caramel dip. Sprinkle the peanuts on top of the caramel and white chocolate. Admire your work before eating. In our ALDI Test Kitchen, we taste-test thousands of products against quality standards to select only the items that meet or exceed national name brands. The culinary professionals on the ALDI Test Kitchen staff go through sensory training and are our resident food experts. They know what tastes best! These next two recipes were created by our ALDI Test Kitchen. Jack-O-Peppers is a filling dish with pasta and peppers that gives you permission to play with your food! Your family will love the ghoulish grins on the peppers. For a party-pleasing snack, our Witches’ Kettle Caramel Corn uses leftover tootsie rolls from trick-or-treating to give the popcorn a caramel consistency. The recipe features a few of our seasonal and special buys, like Clancy’s Popping Kernels (in-store 10/17) and Sunrise Candy Corn (in-store 10/3). 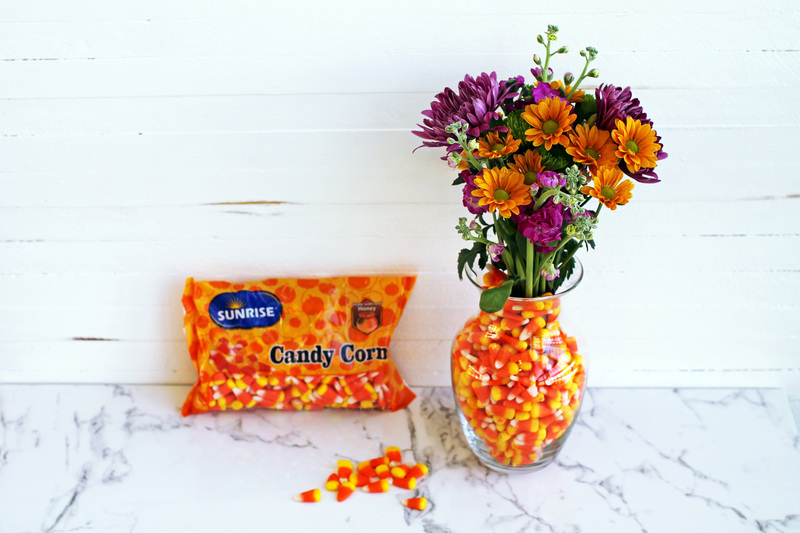 Create this beautiful vase with candy corn. Use the remaining candy corn to decorate. We love candy corn vases! You’ll need a vase that can fit within another, larger vase. If you don’t have a smaller vase, a glass that can fit will also work. Buy one of our Sun Kissed Mixed Bouquets ($3.99) and trim the stems. Fill the smaller glass or vase with water and set within the larger vase. Fill the empty space with candy corn and place the flowers inside. We hope that you have a Happy Halloween! Comment below to tell us your favorite Halloween hosting tips! When is the store in Wichita Kansas going to reopen ?? We love ALDI’s products. But we were disappointed when using your Cream of Chicken Soup in a recipe recently. It was so watered down and thin, it ruined our recipe. Also, we found only a couple slivers of what looked like chicken. On the can it states, “great for cooking” and shows several morsels of chicken chunks in the picture. What happened? We were very sad about this. Shall I take the opened cans back to the store? If you’re ever unsatisfied with an ALDI food item, please return the packaging on your next visit. The manager on duty will be happy to assist you with a refund and replacement.